The last couple of months here at The Natal Family have been very exciting! Last month we saw the publication of The His and Hers Guide to Pregnancy and Birth by our very own founders Steph and Dean Beaumont, and on the 7th July we celebrate the launch of DaddyNatal Online, by Dean Beaumont, in conjunction with Penguin Random House. DaddyNatal was originally created by Dean in response to his experience becoming a father for the first time 8 years ago – feeling somewhat unprepared for the birth of his first son, despite attending antenatal classes and reading books, Dean started the DaddyNatal programme to support dads to be the best birth partners and fathers they can be. Dean: “Every project we launch at The Natal Family has a lot of time, thought and trialling first put in to make sure it is right before going live – and this project was certainly no different. DaddyNatal Online had been an idea of ours for a number of years, but I first started working on it seriously and discussing the concept with a few different potential partners in May 2014. In November 2014, I had my first discussions with Penguin Random House about the project and we continued to work on the idea, proposals and details for it throughout 2015. 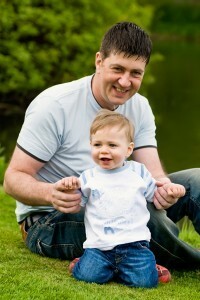 Dean: “Dads can access DaddyNatal Online simply by visiting www.daddynatalonline.com and signing up! The course is split into 11 segments – each of which has a video to watch which gives you all the crucial information, and you can also watch each video as many times as you wish. Each segment also has other learning support materials alongside the videos, including downloads with key information on and quizzes to help dads check their learning as they go along. Dean: “Filming took place at the recording studios of Penguin Random House over January, February and March 2016. 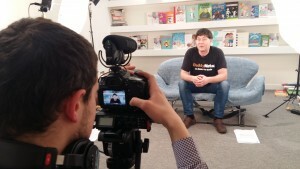 I have done a lot of media work before for numerous TV documentaries but presenting content direct to camera is certainly very different to giving an opinion, being filmed during a class or being interviewed! This is also the first project of this type that Penguin Random House have worked on, so it has been a steep learning curve for us all! The first day of filming in particular gave all of us (the cameraman, the producer and myself!) a lot of learning points. Dean: “It was incredibly different. Being on a set, talking to a camera lens which was literally a few inches from your face, with just two people silently watching was much more difficult than I thought it would be. But the production team at Penguin Random House are fantastic, and we worked together really well to find our flow with it all. Dean: “Absolutely, in the same way that The Expectant Dad’s Handbook was written based on the DaddyNatal classes and aimed at dads, it has a wide female readership too. So many women have written to me saying how useful they found reading the book, and from my point of view, if they also wish to watch and find the DaddyNatal Online programme helpful – then that’s fantastic. It might work for some couples to watch the videos together, but equally it might work better for them to each watch them separately and then possibly discuss anything which might arise from them. Everyone learns differently, there is no right and wrong when it comes to working out how to make the Online programme work to help you prepare – if you both want to use it, just check with each other how you feel would best work for you, and take it from there. Dean: “Firstly, thank you for choosing DaddyNatal Online! I really hope you enjoy it, and if you want any additional support, or have any specific questions, please do contact me. Secondly, and more importantly, congratulations for choosing to do everything you can to learn as much as possible about how to be the best partner and birth partner you can be. It is a great step, and it signals how seriously you are taking becoming a dad. Well, isn’t this just exciting? 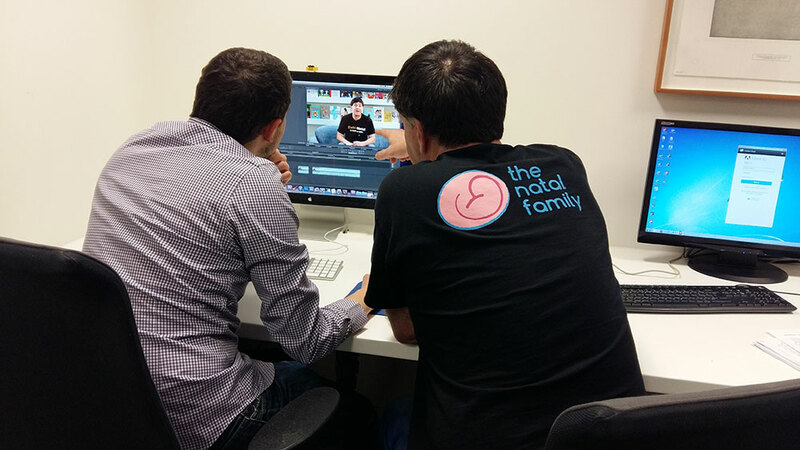 Here at The Natal Family we had been looking forward to this fantastic new project for a while, and it’s amazing to know that DaddyNatal classes and content will now be accessible to so many fathers and fathers-to-be. Thank you Dean for taking the time to answer our questions, and we wish you the very best of luck with this fantastic project! This entry was posted in Uncategorized and tagged antenatal, Antenatal classes, antenatal education, antenatal online programme, babies, birth, birth advocacy, birth classes, birth preparation, dad-to-be, daddy, daddynatal, dads, empowerment, father-to-be, fatherhood, fathers, non judgemental, parenting, parenting classes, parents, pregnancy, The Natal Family by steph. Bookmark the permalink.